Conrad & Metlitzky LLP - The Recorder Covers the Launch of Conrad & Metlitzky: "Government Duo" Sees "Small Law Niche for Experienced Trial Attorneys"
The Recorder Covers the Launch of Conrad & Metlitzky: "Government Duo" Sees "Small Law Niche for Experienced Trial Attorneys"
The Recorder, one of California's preeminent legal publications, has written a feature story on the launch of our firm. 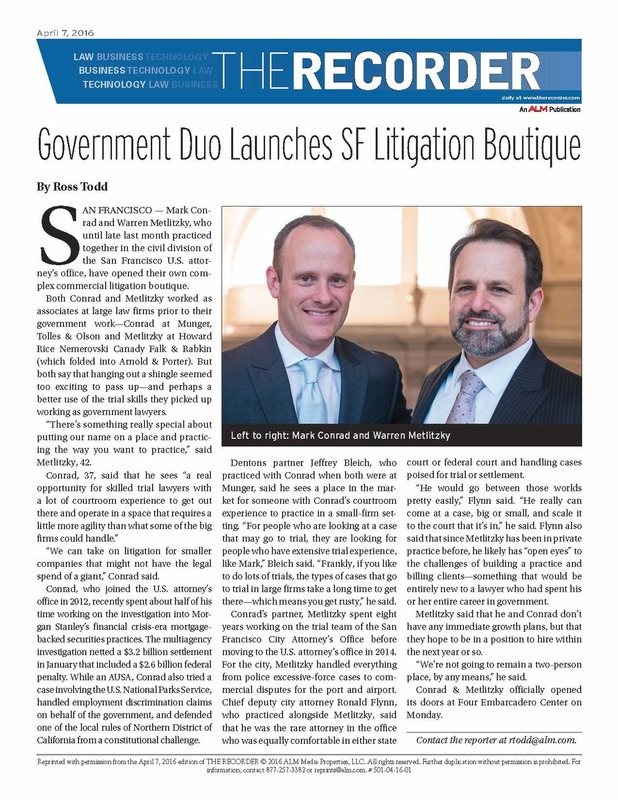 Reporter Ross Todd writes that our boutique provides a "small-firm setting" for the practice of "complex commercial litigation." We are honored by the comments of our former colleagues, who praised our "extensive trial experience" and our ability to "come at a case, big or small, and scale it to the court that it's in." Read the full article here. ← Warren Metlitzky To Host All-Star BASF Panel on "Trial Tactics from Opening to Closing"
Copyright © 2016 conrad & metlitzky llp. all rights reserved.